The Healing Habitat passionately believes that when an Instructor is given the support to grow uniquely, their light from within shines far brighter than imagined, they step into their purpose. Our instructors take on a role so much greater than robotic instruction, they have the ability to connect with you all as leaders and to nurture the students journey into themselves. They are a family unit, whose classes are unique, heartfelt and full of light and love. It is an absolute honor that we introduce the following and the Karmi Yogis who volunteer their time for caring for this space we share. Emilie completed her 200hr level certification at Yoga Space in Shanghai, during her time of living and teaching abroad in China, additionally studying Meditation, Anatomy and Alignment in Yoga, Tai Chi, Kundalini and Tantra. Emilie completed her 300hr level certification with Create Karma, with the mentorship and guidance of Sarah Yukie and the Create Karma Community. Emilie has always found inspiration in the passions of unique teachers such as Nino, Jason Crandall, Noah Maze & Shiva Rea, as they have encouraged a diversified body of knowledge and the belief that our practice should reflect the complexity of a soul. 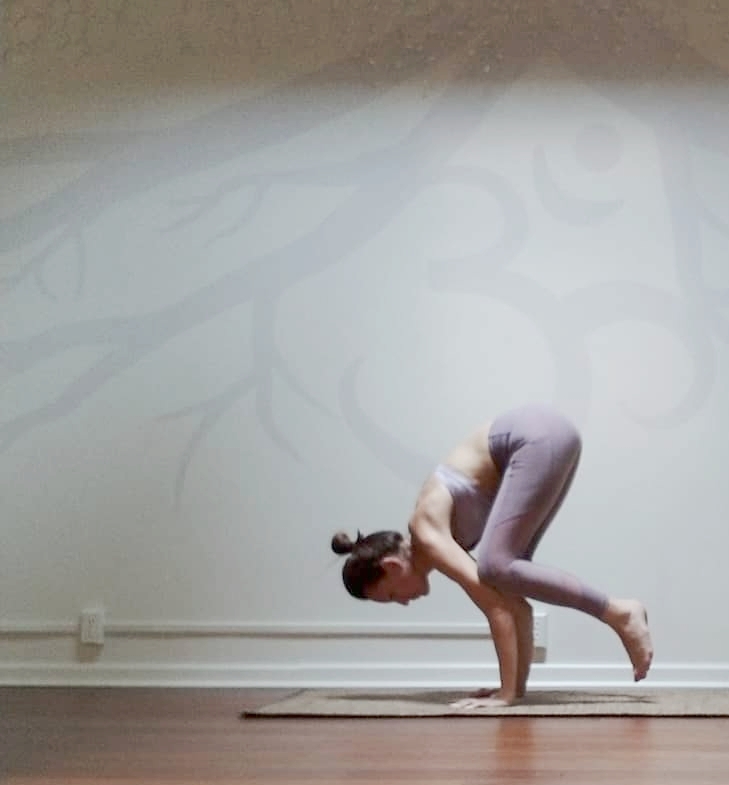 Emilie is inspired by the transformative effects that a consistent Yoga practice has on an individual, as she experienced and continues to experience a personal growth that is empowered, peaceful and full of light. Her practice is heartfelt and intentional, direct and strong. Emilie sequences clear and creative flows and guides students into a place of self love, empowerment and acceptance. She loves exploring intelligent transitions; Arm balances & inversions are her playground and vinyasa flows are her dance. Like many of you, I am a mother and a wife. I have two children, a son who is 20 (Brendon) and a daughter who is 7 (Elliana). I am also an elementary teacher. I began teaching elementary school after many years as a paralegal. I wanted to inspire our youth through creative and memorable lessons and I have never regretted my decision. I currently teach 4th grade and love almost every minute of it. My yoga journey began many years after I was diagnosed with rheumatoid arthritis. I came to yoga after attempting several different types of exercise that took their toll on my joints. I wanted to find an exercise that was fast-paced and energetic, but still honored my physical limitations. In January 2016, I began taking Vinyasa Yoga classes. I loved it immediately. I wasn’t flexible and I got winded quickly, but I continued my practice and slowly, yoga seeped its way into all aspects of my life, leading me to achieve my 200 Yoga Teacher Training in March 2019. What does yoga mean to me? Yoga means practice, patience, self-acceptance, self-empowerment, sympathy and love. Yoga is holding space for yourself and for others. Yoga taught me to love myself for who and what I am and to forever and always be kind to others. Through yoga, my goal is to help everyone achieve the same attitude towards themselves and others. I want people to love their bodies for what it can do for them. I want them to see that through hard work, practice and patience they can meet any goal that they set for themselves. Today, I continue to enjoy the fast-paced, energetic world of Vinyasa Yoga. Much like my elementary lessons, my goal is to create a fun, fast-paced atmosphere of self-exploration where you can feel free to play and grow in your practice. Test the waters and see where your body can take you. Yogilates is a fusion of Yoga & Pilates. Set your intention, and discover your power and grow in strength through a 1 hour flow with Joy! Joy will focus on building your core strength, increasing your flexibility and detoxifying your body and mind! Joy has been teaching Pilates for years and since completing her Yoga certification in Bali, she brings together an all-level fusion of the two practices. Chelsea completed her 200hr YTT at Yoga on Chocolate in Hershey, Pa. There she learned to lead a strong and thoughtful class, as well as meditation and breathing techniques. Chelsea’s favorite parts of teaching are adjustments and connecting with her students. She likes to make her students feel empowered and confident in their bodies. I have been doing yoga for about 15 years now and its quite the love affair! I started practicing when I was 16 because it felt like coming home to my body, and in 2014, finally decided to become certified to teach so I could share the wonderful healing power of yoga with others. 500 hours of training at Om My Yoga Academy in Camp Hill and many teaching hours later, I finds myself at the Healing Habitat where I look forward to meeting new souls, and sharing my light in a new space. My Favorite yoga pose is Tree Pose. It is a graceful dance between staying connected to the ground, and reaching for the stars as we embrace the fullness of our being. Alexis began practicing Yoga 4 years ago as a way to incorporate more health, wellness, and spirituality into her life. She knew after witnessing and researching the benefits of the practice that Yoga and Meditation needed to be a part of her life. Alexis graduated from Kutztown University with a BFA in Communications Design and both Yoga and Meditation helped to maintain stability and peace of mind during her studies. After graduating, Alexis began her journey into wellness and completed her 200-HR YTTC at Yoga On Chocolate in Hershey, PA. Alexis believes yoga is a way to reach one’s unlimited potential and balance the mind. She teaches a Baptiste-Style Power Vinyasa Yoga and loves to play with inversions. T's teaching style is a fusion of mindful energy movement, anatomical alignment cues, vinyasa flow, and whole person health. She strives to empower students of all levels to grow and transform. T integrates a fun passion for life with her experiences as a wellness program facilitator, certified pound fitness instructor, certified aerial fundamentals instructor, certified 500 RYT yoga teacher, and years of posing thousands of people as a professional photographer. T believes that "Yoga is not just stretching or exercising on a mat ....With regular practice, yoga is transforming." Yoga first revealed itself to Liz in high school. After playing soccer and basketball from the age of five, she employed yoga as an off-season training technique in an attempt to stay limber. Liz began using yoga as a tool towards self-healing when she realized it was relieving her long-term back pain. She delved further into her yoga practice while she was teaching ESL in Vietnam. Liz committed to a daily asana practice and began exploring meditation techniques. She traveled to the birth-place of yoga in Rishikesh, India to complete her 200 hour Yoga Teacher Training Program. Following Teacher Training she taught bilingual vinyasa styled classes in Argentina before moving back to the US. As an ESL teacher, Liz has lived in three different countries in the past six years. Yoga was her constant in all this time of change. No matter the continent, language or culture, when she steps on the mat it always feels like home. Liz has continued her yoga studies by attending courses on Trauma Informed Yoga and Injury Prevention. She is dedicated to continuing her education of yoga and wellness. Liz’s classes flow at a deliberate pace to encourage self-inquiry and expression. She focuses on opening up the areas that become clogged due to everyday stresses. At the same time, she works on strengthening, to elevate the balance of the mind and body. The culmination of personal life stressors and joint pain from many years of competitive running left Mary feeling helpless, frustrated and fatigued. In search for a solution to restore balance in her life, Mary stumbled upon and fell in love with hot Vinyasa yoga. After a couple of years of consistent practicing, vast changes in her flexibility, strength and life began to occur. Not to mention…no more hip or knee pain. The benefits were profound and impossible to ignore but undeniable earned. With the initial goal to learn more about the philosophy and intricacies of yoga and to delve more deeply into her own inner workings, Mary completed her 200 HR Vinyasa Yoga Teacher Training at Dana Hot Yoga. As a yoga teacher, Mary’s goal is to share with others what yoga is continually teaching her, self-love, patience, compassion, gratitude, non-attachment, non-judgment and to let go of things that no longer serve us. Mary aims to make each class energetically focused and challenging yet light-hearted and transformative by integrating life themes that students can practice both on and off the mat. Her mission is that you leave the mat feeling a little lighter, more balanced and energized after each class. "I grew up a little all over the East Coast of the country, but I spent most of my life in Lancaster County. I have 4 wonderful children, which brought me to Hershey. I connected with Em through the Hershey Area Mom facebook group, and after my first Yin class - I was hooked. I was searching to find myself again, or perhaps for the first time. That's exactly what I did on the mat. I found things here that I didn't think existed for me - compassion, peace, love, community, true happiness and strength. I have transformed not only in how I view myself, but also in how I view the world. It's easy to notice the changes in our physical body from practice, but the more subtle changes are by far the most profound. Learning to love and trust myself and others has had such a huge impact on my life this past year. I am not only the happiest I have ever been, but I also feel like the most authentic version of myself as well. My mat humbles me, challenges me and strengthens me every time"